I sit here, on the couch, under not one, but two blankets, because it’s just so cold. Nearly too cold to move. I’ll need to move. There are animals that need fed. Projects that need continued. But right now, I’m content just trying to not freeze to death. It’s 7. Seven degrees outside. The windchill – I mean, who really cares at this point. It’s just miserable. If you can’t tell – I have real issues with winters in the mid-west. They make me salty and sassy. The pellet stove has definitely made this winter so much more comfortable. When it’s just awful outside – we can warm up next to the stove. I’m so thankful for that. Tonight we’ll be doing a family slumber party in the parlor. Sleeping near the fire, watching a movie, snacking on homemade caramel popcorn. YUM! I think it’s cool that, even as our kids age, they get really excited about stuff like this. They don’t make plans with their friends, because they don’t want to miss the family slumber party. Must mean we are doing something right, as parents. HUH? I am really hoping that the great thaw begins very soon. We have “meat birds” that NEED slaughtered. I say need because of two things – 1) they are just gross, at this point. Step, step, sleep…eat eat eat. 2) they will be 8 weeks on Monday and well…health issues can begin, broken legs, etc and their humane life will degrade to miserable. That all said, I have no desire to stand outside slaughtering, defeathering, and gutting birds – in 7 degree weather. UGH. Options – perhaps we do the deed in our garage? I’m not sure. But either way – I think that Saturday Slaughter Day will arrive next week. We’ll have 8 birds ready for the freezer…such a good thought to have home grown birds in the freezer again. We’re waiting…and waiting for Maple Syrup season. We’re hoping to build an outdoor fire this year, to cook down the sap and make the syrup. I found a pan at Wasserstrom, that I’m super excited about. I believe it’s around 20 X 12, and 4” deep – stainless steel. If we can put it on a fire and cook everything down outside, rather than in my kitchen – where the walls get all tacky – we’ll be so much better off. The weather looks like it could be the right combination of below freezing at night and above freezing during the day over the next week to week and ½. How cool would it be to boil down some sap while we are getting the chicken slaughtering done?! So Mother Nature, don’t you know we have plans? Chicks are heading our way! 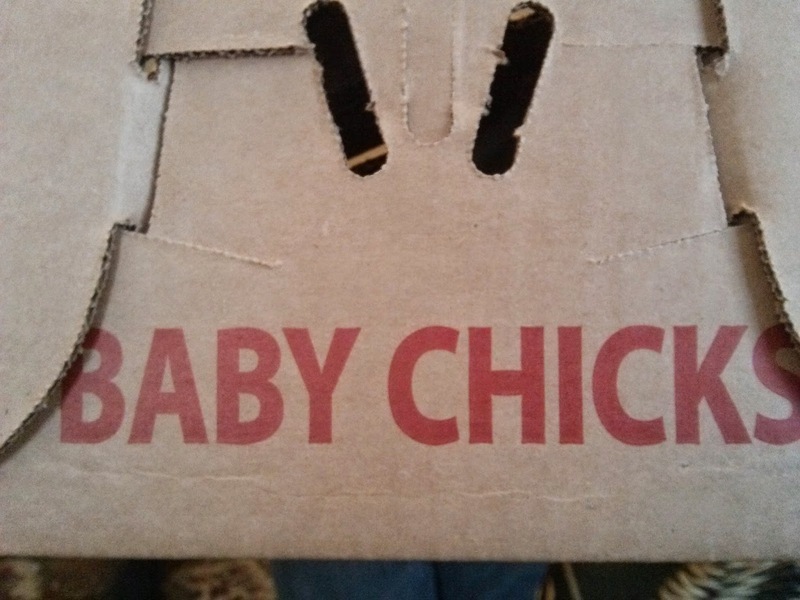 I received a notice that our chicks shipped out today! We have 10 meat birds, one Rhode Island Red, three Easter Eggers, one "adopt a chick" and a Meyer Meal Maker (a chicken to donate) ... I worry that it's very cold. I'm hoping that they'll put in a heat pack to keep them toasty warm during their travels. That’s right kids! 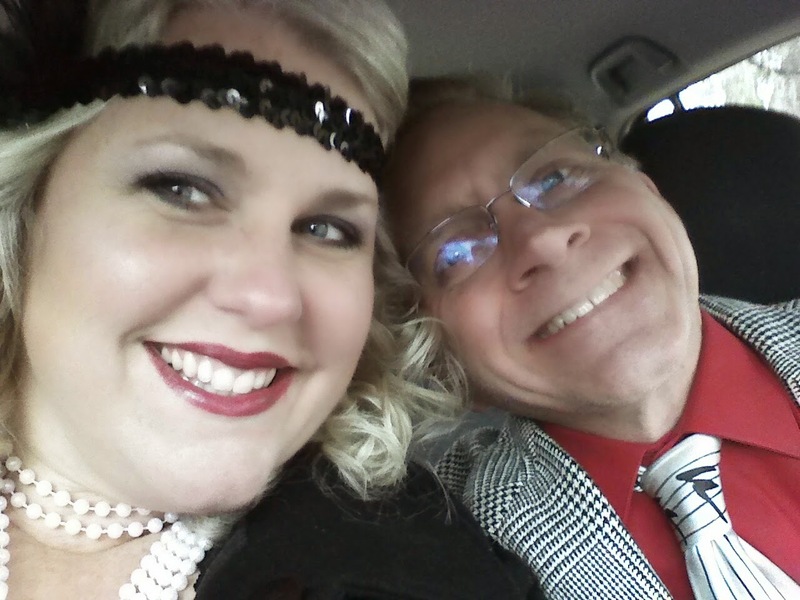 It’s a New Year miracle…here’s a blog post from Fresh Egg’s Farm! I’ve owed you all a post for a long time – life kept getting in the way. I’ve tried to keep FB followers in the know – but I really needed to come and talk more in depth about what’s been going on around FEF....and then….my husband posted on HIS blog (Marxwell’s House) and then I knew I HAD to post here. I mean, if he posts like 1-2 times per year and could find the time…then so should I. So here is goes – forgive me if it’s too wordy…there’s a lot to say and its been a while. The Fresh Egg’s Farm kids are awesome (as usual). We’ll start with the youngest, Miss Cora. She’s been more active in singing at school. She loves her chorus and has even done some solo/small group pieces during the concerts. She also performed at her talent show – this is something that I know Mark and I could never do. It’s hard enough to get up and talk in front of people – but to sing, with a microphone, in front of people, by myself….uhhhhhhhhhhhhh nope! She’s so strong though and it really impresses me. Around the farm – she’s been helpful with cooking and caring for the birds. She’s primarily responsible for the chickens and turkeys, and although she’s not always sunshine and roses about taking care of them, she does a great job! Drake is still playing the flute for his school band. We’ve gone to a few concerts this year for him and I like to watch him perform. It’s amazing how much different an 8th grade band sounds, compared to when they started in 6th. Drake is always helpful around the farm. He’s the first to be ready to go (typically) – grabbing buckets of water, jumping over stall walls to get in there and feed, or move animals around. I love his adventurous soul too. He is one to go out and explore – it helps cure his boredom and he learns a lot from his surroundings. Gage turned 16 this year…which means that we are in the throw of teaching him to drive. He has saved enough money for his driving school and should be starting that soon. He also started a job at a local grocery store (Kroger) – he’s bagging groceries and working on learning cash register. He’s working hard in school, as this year, his junior year, proves to be the most difficult, so far. He’s in a lot of higher classes and sometimes struggles to find the time to work, socialize, do school work etc. I think it’s important for him to have balance in life. We just need to make sure that he can keep good grades while doing everything else in life. Mark and I were able to take the entire summer off, with the kids – since I was on unemployment and had some money saved from my company’s package. It was nice being able to just be together as a family. I dream of a perfect world of winning the lottery and being able to do this full time. Being at home, creating a space at home to share with others, to teach and learn – being financially comfortable, while having all the comforts that we prefer in life…but the reality is that, for now, we both need to work outside the home. So comes the announcement that I am currently working for a VERY local company (Roberts Farm Equipment – no relation to our Roberts family though). The business is just about 3 miles from my house and on the way to Mark’s school. Each morning, after we get Cora on the bus, Mark and I drive in together. He drops me off and heads into his job. It’s nice spending those few minutes alone with him each morning, during the week. He’s my best friend and I love talking with him, or just having a few silent moments of being together. He picks me up from work – which also gives him a little extra time at school each day, to work on things around there. Our kids are all old enough now that they can get off the bus and be safe until we get home. At my work – I do a little of everything, that’s how it is at small businesses…I was hired for bookkeeping, but I also help with answering phones, shipping products to customers, assisting with their ebay store and website development. They are building out their online store and I’ve been helping with that process. I really like it there. Some of the people that I work with are just really nice people and I think it’s good for me to get to know some of the people in our community that come in for tractor parts. Here on “the farm” – I feel like we’ve done so much, but have barely checked any of the boxes on our last year’s goal list. I had such high hopes for this year, but it seems like we either have time or money, never both. We were able to work in a trip to Upstate New York…a small town called Chittenango. Chittenango is near Syracuse and is where I grew up. On our way there – we made it as much as an adventure as we could. We stopped in Erie, PA – who knew what a cool like town that is. We stumbled on a great place to eat that was reminiscent of a 50’s style burger/beach joint. Afterward, we headed to a small “beach” on Lake Erie and let the kids play in the extremely cold water and saw some really cool sand art. 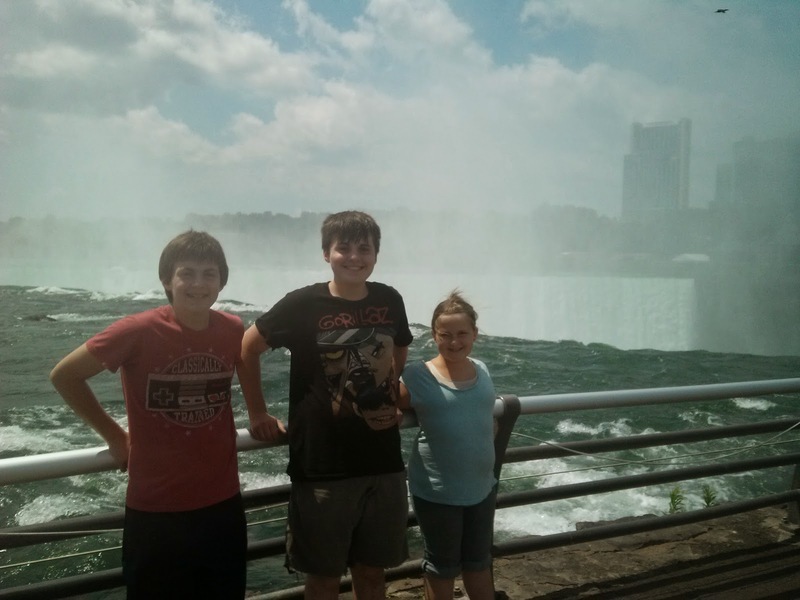 The following day of our journey took us to Niagara Falls. If you haven’t been there…GO. It’s so beautiful. You can see Canada just across the waterway – you can visit Canada too – if you have your passport (which is on our list of things to purchase). The falls are beautiful too. You can catch rainbows in the sprays, watch people on the boat rides below getting drenched. It’s very majestic. We moved on to Chittenango area and spent some time with my aunt (she’s actually my mom’s close friend from high school, who has always played a significant role in my life). She has a beautiful home, on Oneida lake. What a great time to wake up with a cup of coffee on her deck and watch the boats drive by. We tried to experience as much as we could while we were there. We visited Green Lakes States Park (a great park/campground that I used to frequent as a child), Nora’s Candy Shop and picked up some turkeyjoint candies (if you haven’t had these – you are missing out in life – my Nana and Ga used to always have a jar, or two around the holidays and we couldn’t wait to get our hands on them – PS: they aren’t really from a turkey), Sylvan Beach playland and Eddie’s restaurant (such great memories of this place…so many family meals we’ve had there), the Oz museum (my hometown is the birthplace of the author of the Wizard of Oz series – many things around town are Oz-centric – and the museum is GREAT! We got a private tour by my old babysitter, Barb and got to see so many neat Oz memorabilia items), we visited Fort Stanwix and learned about the fort and more about the Native American culture that surrounds that area. It was a GREAT trip and we are so thankful that the girls (Tiff and Kait) were able to help us out and watch the animals/farm house while we were gone. It isn’t often that we are able to get away like that. My cousin, Tonia, and her family made a visit to Ohio this summer too. It’s so great to see her and her girls (she has three young girls – that just seem to love being on the farm) – we took them down to the creek near our house and found crayfish (crawdads), saw minnows, swam for a bit and saw a snake! The creek has become a fun place for us to explore. 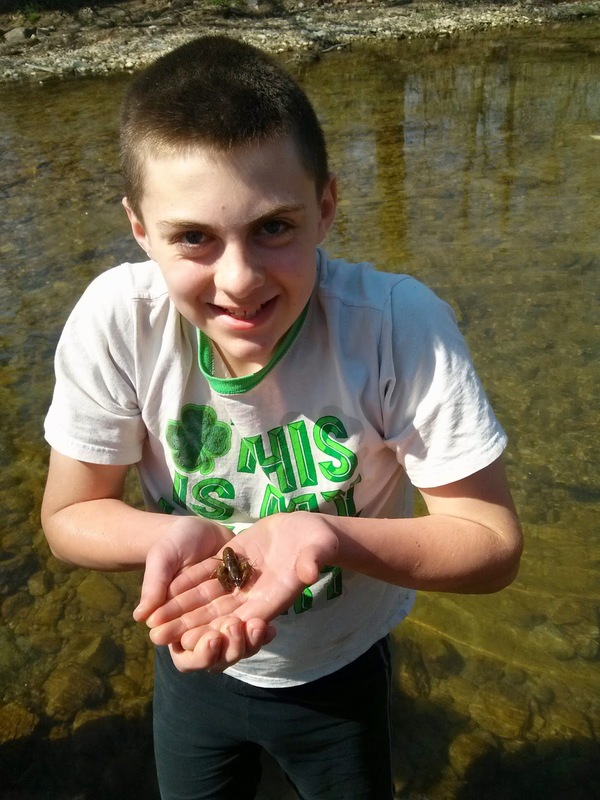 Earlier this year, Mark, the kids and I visited the creek and collected a bunch of crawdads. I told them if we caught enough, I’d boil them up. I made a Louisiana style Cajun boil and boiled those babies up. We sat on the front porch and ate crawdads. Inside the house, we were able to pull up the carpet in the living room and parlor. I’m excited about the floors that we found underneath! We need to rent a sander, briefly. To get these babies sanded and then coated, to help them shine. But they are in really good shape. While the floors are stripped, we are working on getting all the old lacquer off the wood work – to get them beautiful again. With each step of the process, Mark and I are dreaming about what we want from each room. In the parlor, we removed a closet that just wasn’t very functional for us – by removing it, we are able to fully open the double doors as you enter the room. Opening up the seating space we have. My parents bought us a TV for Christmas, which will go in the Living room and the smaller TV that WAS in the living room will now go into the parlor. Giving us two separate, but connected areas to hang out in. This will be especially great when we have larger gatherings. Children in one area, older people in another…or however it works out. We’ve got a big family that I expect to continue to grow, once grandchildren come into the picture and we need seating space for everyone. The parlor is especially nice because one of the things we DID check off the list is a stove for that room. We purchased a wood pellet stove! It’s large and powerful enough to heat our entire house…mostly the parlor and living rooms are toasty warm and the other rooms are chilly, but mostly comfortable. Plus, cool rooms make for great sleeping. It’s so nice being able to come into the parlor and get warm by the fire. We’ve even toasted marshmallows in there! The goal for this room is to create a comfy space to talk and hang out. Outside the windows we are planning on putting in a bunch of bird feeders, a bug hotel, a bird bath and maybe a small beehive, to be able to view from the windows of the parlor and be close to nature. There’s a local park (Aullwood Nature Center) and they have a bird watching room and it’s just SO relaxing in there. I’d like to have that type of space for us and our visitors. We still have so much to do inside the house…we have the rest of our lifetime to do it. But it’ll be nice once our place is less of a work zone and more of a home. Outside the house we were able cut back a huge area of brush in the front hedge area. Once we burn off the wood and brush from that area, we’ll be able to put in the arbors for grapes and kiwi. I love having so much food on the property. Pretty soon, we’ll be getting more and more fruit from our trees and putting that food up for the winter etc. YUM! We have a huge blackcap (wild blackberry) patch in our backyard, near the neighbor’s farm field – typically, we’ve been getting around 3-4 pounds of berries from this patch. This year though we got over 10 pounds of berries! It’s awesome! We put two of our beehives out near the patch and not only did the ladies love it, but we benefited from all their pollination! Speaking of the bees. I still just love having them! They are so cool to watch and learn from. Some days, I wish I could just sit and hang out with them…but they’ve got a job to do (and usually so do I)…so it’s best to just let them bee (har har!). We started out the season with four nucs…as one started to fail, we were able to capture a swarm (still such an awesome experience) and combine the swarm with the failing colony…and then another started to fail…so we combined that with the swarm colony. Entering winter we had, what we thought were, three strong colonies; however, recently we lost two of them. I believe one was due to mites (although, when we did the mite test…we didn’t see any mites – so I’m not exactly sure what went wrong there) – we hate to just treat for mites automatically, but maybe that is a necessity these days. We were hoping for strong bees that could be strong against the mites – but maybe that’s just not a reality. The other hive, we believe, either went queenless or just collapsed, without real rhyme or reason. That said, we are hoping that our last colony survives the winter – so far, so good. They should have plenty of food, plenty of bees, a strong queen etc. If we can keep this colony strong into the spring, we might have the opportunity to split them and create two colonies! We’ve also been talking with Don Popp (a local beekeeping master…and a great mentor) and he said he could put us on his swarm call list – he said last year they had twenty or so calls for swarms!! TWENTY!!!! If we could just get a few of those, we’d have free bees!!!! Not to mention that we’d have the experience of swarm catching (and I love adding things like this to our life resume). This year, we harvested honey, enough to sell to friends and family…and to make a batch of homemade baklava (holy moly! YUM). Next year, I’m hoping to get enough honey to start making Mead. Home brewed alcohol…OK! We also had the opportunity to mentor some of our friends as they started their beekeeping experience. They bought a complete hive and their bees were going gangbusters! Such a strong hive…so much honey. We were happy to help them become the beekeepers that they are! We’ve had a bunch of highs and lows with our animals. We finally got our sheep castrated, but ended up losing Steve, shortly thereafter. I’m not sure why he died, but that was an extremely heartbreaking time on the farm. We also had a rough goat delivery year and lost a couple at birth and lost another, Bandit, when he was still a baby. Josie, one of our alpacas passed from old age. She was a good girl and we miss all the ones we’ve lost. The pasture seems a little empty. With just a sheep (Jester), an alpaca (Blossom) and five goats (3 dairy and 2 angora) left…oh! And Kennedy! I haven’t spoken about Kennedy here…I don’t think! 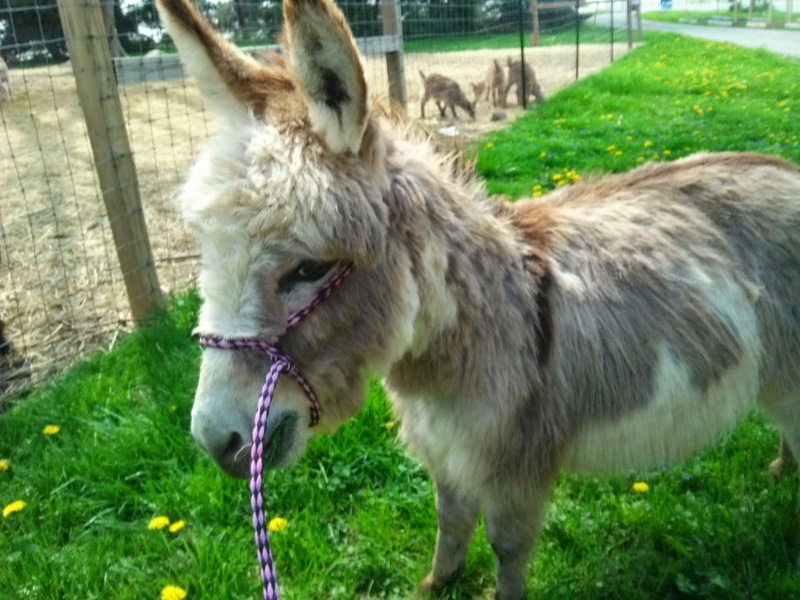 Well…..we ended up getting a miniature donkey! He’s a sweet boy (although he needs to learn some manners, when it comes to coexisting with the other animals) – I just adore him and his HEEEEEEE HAWING! We are learning shearing this year. We were able to shear all the fiber animals – me, Mark and the kids (and my cousin, Rhett even helped). We still need to work on technique – but I’m happy with the progress that we’ve made. We took Mabel to our friends at Long Lane Alpacas to have "date time" with one of their goats. If she is pregnant, then we’ll have goat babies around March and goat babies mean farm cuteness AND milk. We’ll hopefully be back in the milking game come this spring. Which means milk, cheese, soap and….I don’t know what else! But it’s exciting to think about. We put in another order for chickens. We ordered a few more layers and ten meat birds. They should be arriving next week! We are hoping that the layers, by getting them this early in the season, will be laying well before fall. The meat birds will be ready for processing in about 7-9 weeks – so approximately the first week of March. It will be great to have birds in the freezer again. They make for such an easy meal. I’m hoping to get a deep freeze (I prefer stand up, but a chest might be a nice temporary fix). It would also be nice to get on a schedule of getting meat birds more regularly…and then we can process and freeze them and hopefully never have to purchase birds from the store. Currently, we have seven layers and seven turkeys…THAT’S RIGHT – our plan of breeding turkeys worked. Loner and Mama have five offspring in there. Peepers (was born in the early spring, in Mark’s classroom incubator – such a cool experience for his students) and six more were born, but unfortunately two didn’t make it. I believe that we are keeping Loner, Mama and Peepers and the other four will be for food. Having this many birds is nice, but we need more space and a different layout. Their coop, right now, is just a converted shed. We need to create a space that has better ventilation, more space, the ability to separate chicks from birds, better heating/lighting options etc. We also need to have better yard areas for the birds. Oh I just can’t wait until our entire property is fenced and we can let them wander a bit, without worrying about disturbing neighbors. But for now, giving them a better coop/yard space is better. As usual, our list is long, but it will eventually be done (but then we will have likely added a billion more items!). Hello everyone! Hope you are doing well in blogland! I'm going to stop apologizing for my absences and just let you all know that, whenever I possibly can, I will update the blog with our (mis)adventures LOL. As you all are, I'm sure, we are extremely busy trying to make everything happen. This summer is going to be a wild one - since Mark is a teacher, he is off for the summer, I am currently unemployed and the kids are home for summer break too - this is the first summer we've ever had, where everyone is here! This is the summer of projects. We've already finished building the raised beds and planting most everything (still need to find a spot for those gourds). We've also decided to expand Cora's bee garden - originally, we were going to create a simple raised garden bed to help support the bees (and other pollinators) - however, we've decided that most of our backyard isn't very functional for us. Eventually, we are adding a back deck (when time and money allow) - our large vegetable garden and apple trees (and likely the chickens/turkeys) will remain back there - but instead of having just a mess of weeds and grass that we need to mow down, we are thinking of changing that into an entire garden space to support butterflies, and honey bees etc. I've been compiling a list of plants to add to our space - plants that will bloom throughout the seasons and will provide both nectar and pollen sources. It's exciting for us. Imagine looking out over the deck and seeing all these amazing flowers and pollinators making their way around. LOVE LOVE LOVE it. Now that we have four hives - yes FOUR! We need to make sure that we are giving them all of the natural goodness that we possibly can. Speaking of bees - guess what we did for the first time EVER...Captured our first swarm!!!! It was scary, exhilarating and exciting all wrapped up in one bee cluster! Our neighbors (from about a mile or so down the road) - the ones that provide our hay to us, showed up in our driveway and asked if we could help them out. The wife is allergic to honey bees and they were pretty sure there was a swarm in their tree. Mark and I suited up, grabbed a box and away we went - it took about an hour to get there, capture the swarm and get those girls home. It went amazingly well for our first swarm capture - especially since the property owner was watching us. We feel like we deserve a badge or something lol. There should be like the homesteader collection of badges (I slaughtered my first chicken, I captured a swarm, I ran into the barn without shoes and didn't get worms) - we also feel like we should create a list of things we thought we'd never say to each other like "Eew, the cat is eating the goat's placenta"...but that's another story. We combined the swarm with an existing hive that had gone queenless....and they seem to be getting along really well. We need to take a look at them girls later this week - we are hoping that one of our beekeeper friends will be able to make his way over here (Friday?) to take a look at our hives, offer suggestions etc. Also this weekend we volunteered at the BCBA/OSBA Summer Beekeeping Symposium. It was at Miami University and had a bunch of great breakout sessions - we really enjoyed helping. BTW - if you haven't heard of BEEpothecary - you should go check them out. Great people - Great products! So far, they taste amazing - I just hope we can finish the last step of getting them cut and tossed with the cornstarch/powered sugar mix. Fingers crossed! We ended with three baby goats this season. I was thinking we had one more mama - but she doesn't seem to be doing anything - so maybe she wasn't bred afterall, or maybe she lost the pregnancy. The three little ones are doing amazing though. They are running around the pasture - chasing after each other, driving the grown ups crazy. At first, it seemed like some of the grown ups weren't fans of the little ones - but it seems they have accepted them as part of the flock. I'm not sure if we are keeping all or all of these - it seems it would make sense to keep the girl - but the boys are so damn cute. We'll see...there's only so much room at the inn....and frankly, I'd love to get a donkey. Mark's not going to let me get a donkey AND keep all the goats. We've been gardening a lot these days...building our raised garden beds, with trellises (we still need to add another bed to that area and four of the trellises - but we are getting there. We also need to build a permanent bed for asparagus - our seedlings are doing amazing and we'll need to get them transplanted soon. We decided to grow the asparagus from seed because we aren't in a rush to get them (it takes 2-3 years to get the plants producing) and from what I've read, if you can get them to establish from seed, you have a stronger plant and bigger yield etc. We also need to build another bed for Cora's bee garden. Last year at Mother Earth News Fair, we bought Cora a bunch of seeds to create a garden all her own - the seeds were selected to encourage pollinators to visit - so she should be seeing all types of butterflies and honey bees etc. We also got a bird bath to put into the bed - we will put colorful rocks in there so the bees have space to land and get a drink, without drowning. I'm really excited about that garden...Cora and I sat down and planned it all out, what to plant where etc. I'm hoping it is beautiful (I'm sure it will be). Yesterday, we transplanted 32 of each of the following: broccoli, cauliflower and cabbage to the raised beds in front. We also transplanted 36 brussels sprout plants and planted a row of carrots and a row of beets in the back garden. Finally, we planted 10 pounds of potato "seeds". I love that we've been able to most everything in the beds using our own compost. OH! We also have three large pots for lettuce and spinach mix. Whew! YAY food. I mentioned in a previous post that we ordered additional trees etc. Shortly before those items shipped, we decided to cut back a bit. Mainly because of money. We had a lot of money going out for our crazy goat deliveries and rough winter, so we decided to not get the asparagus crowns (and our seedlings are doing amazing...so WIN! ), we ordered 1/2 the grape vines - we originally were going to get two sets, but figured that one set would be good enough, we decided against that tangerine - because that is an indoor, wouldn't it be cool type of tree, more of a novelty, than a necessity so it went on the back burner. I think that was a smart decision. We've got time to do all of this stuff - I get the "I wants" and I want it all to happen at once...but this is our home, for a long time. In June of 2011, my husband, three of our five children, our Black Lab (Blue) and our four inside cats (Freak, Fizzle, Rusty, and Bella) and three rabbits (Luna, Midnight and Winchester) have been living at our 1.3 acre farmhouse. We’ve been working on converting the land back to a farm. Since moving here, we’ve acquired a Great Pyrenees (Ollie), a number of outside kitties, a handful of goats, a couple sheep, a couple alpacas and bees/chickens are scheduled to arrive Spring of 2013. We also planted a number of fruit trees on the property (and plan to add a few more) and have been working on putting in gardens to grow as much of our own food as possible. We certainly aren’t experts in any of this, please join our adventure as we muddle through becoming farmers, beekeepers, shepherds and more.